From the moment I could read, I lost myself in books. Exotic worlds opened up to me from between countless pages. It was my escape, my joy, my education. Many years later, I am making the transition from print to digital. While I embrace this brave new world, it is not without a sense of loss. Gone is the scent of a new book, the feel of the pages between my fingers, the heft of a tome. Now, a book is an artifact, its essence extracted and reduced to bits and bytes. My teacher Carol Bishop at LAVC instructed the class to incorporate the cover of a book into a work of art. Being a concrete thinker, I decided to take the assignment literally. And, since printed books are going the way of 8-tracks and dinosaurs, it is not difficult to find source material. That said, it was painful for me to destroy this reprint of the 1908 edition of Rudyard Kipling’s The Jungle Book in an effort to transform an artifact into a work of art. I rationalized putting the book under the knife by considering it a kind of recycling. Inspired by pop-up books, the characters leap off the page into the reader’s space. For my color scheme I chose warm browns, greens and golds with buff titanium. These colors hearken to the John Charles Dollman illustrations as well as to the colors of the stunning Indian Rock Python, for an earthy antique feel. 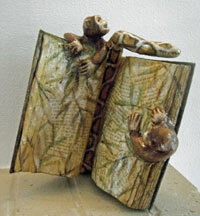 The book opens to “Kaa’s Hunting”, where Mowgli the man-cub is captured by the Bandar Log or monkey people. Mowgli’s mentors Bagheera and Baloo enlist their onetime enemy Kaa the python to battle the monkey people and free Mowgli. A few dead monkeys later, Mowgli escapes and rescues his friends from the hypnotic gaze of the python. This is a little darker than the Disney version, which I also love. This piece is the first in my Living Book series. I have some ideas, but suggestions are welcome! Fabulous, Sarah! Very clever and really lovely!